Typically, "playing" with your hermit crab is a matter of giving him the toys he needs to entertain himself -- you're not going to have much luck teaching him to fetch. If you want to take him out to spend some time together outside of his habitat, he won't mind. But you'll want to be careful about how you handle him. Give him toys in his aquarium. Hermit crabs generally like to play without much human assistance; but when they have the right toys, they couldn't be happier. A well-stocked aquarium is all your hermit crab needs to play, so give him a combination of things he can climb on, through and under. Driftwood, flower pots and specially made half-logs are popular with hermit crabs. Yours will play for hours with his habitat's new toys. Take him out of the aquarium for quality one-on-one time -- just do it very carefully. No matter how much he trusts you, your hermit crab won't hesitate to clamp the claw around your fingers if he feels threatened. Pick him up by the shell, never from the front, and give him room in your hand without closing your fingers around him. Even then, he may be inclined to pinch, so bearer beware. Set him on the ground and let him do some crawling. It's not recommended to put him on top of a surface like a table, because hermit crabs can't always see what's beneath them and could be liable to fall off an unexpected ledge. Letting him on the ground for exploration is great playtime for him, though. You may put down some toys while he's out. Remember, he loves to climb on things and find little hiding places, so give him environmental obstacles to play on. 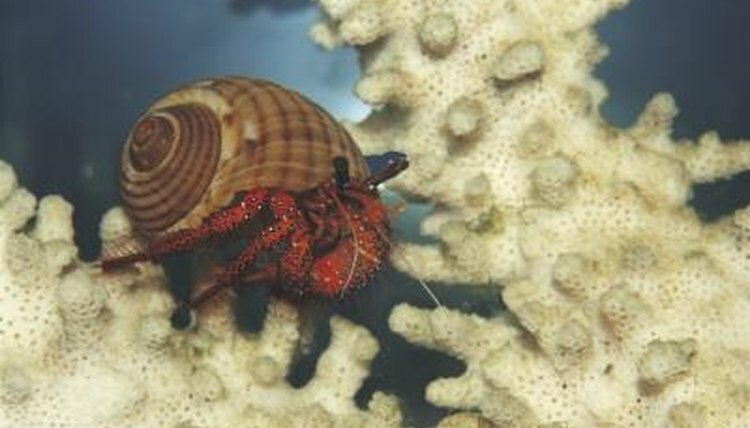  When choosing toys for your hermit crab, stick to ones specially made and marketed for the species. Choosing the wrong type of wood -- evergreen wood, for example -- can irritate your pet.  Playing with your crab on a regular basis builds trust and strengthens your relationship. Taking him out for playtime once a day or so is plenty.